Murchison House Station borders Kalbarri National Park making our exploration easy. On our first day plan was hindered due to flooding of the river preventing access to Nature’s Window, so we drove along the coast to see the Natural Arch, Island Rock, Mushroom Rock, Rainbow Valley, Red Bluff and Eagle Gorge. Did I mention the flies? On the side of the road to one of the sites we found the cutest Thorny Devil which made Amanda’s day. The coastline is stunning and the geology changes frequently, presenting different rock formations, and colours all within a short stroll from the car park. Another excursion saw us driving back to Port Gregory to revisit the Pink Lake there. The Pink Lake in Esperance hadn’t been pink and driving past Port Gregory the first time it hadn’t looked much better. Assured that it wouldn’t disappoint in the sunlight we picked the day and wow was it pink (especially with polaroid glasses on). The Blue Holes just outside Kalbarri provided an opportunity to get some snorkelling in and despite the small area it was full of sweetlips, cod, mullet, small crayfish, nudibranchs and heaps more. The funniest thing I ever saw were the people sunbathing in bikinis with fly nets over their head. I wish I’d taken a photo! Did I mention the amount of bushflies around now. Between the march flies (slowbiters), bushflies(just pesky), mossies (discrete biters) and now sandflies (small sharp biters) our patience is really being tested. When the road re-opened we made an early start to capture Natures Window before the hordes arrived, and there were hordes by the time we returned from The Loop walk. The Loop walk stopped abruptly by the river where the trail sign pointed into the river (see photo). Z Bends provided an outlook over the river and a walk took us down a shaded chasm to the water. People abseiled down the cliff face as we wandered past. Hawks Head juts out above the river valley at another site, but for me Ross Graham was possibly the most photogenic, after Natures Window. The National Park was stunningly beautiful and hard to do justice through a camera lens, but well worth at least a couple of days exploring. Murchison House Station was founded in 1858 by Charles von Bibra to provide meat and wheat to lead miners at Galena, beef to the growing Perth market and remount horses to the British army in India. The original homestead “von Bibra’s cottage” was built by Charles von Bibra with convict labourers in 1858. Using local materials it was constructed from Tumblagouda sandstone and mud bricks. The original shearing shed also dates back to the 1860’s. In its heyday up to 35,000 sheep would be brought to this shed for shearing. Features inside include the extensive use of Oregon pine and the 100 year old wool press and wool classing table. Located only a few kilometres from Kalbarri it served as our base for a few days while exploring the area. Unfortunately for us the recent rains had caused the river Murchison to flood and access to the opposite side of the river was closed. Due to school holidays there were plenty of kids around of similar ages to ours. Many hours were spent in the goat shed, then rounding them up again when Oscar accidentally let them out. Then the home-made billycart was dragged from a shed and more hours spent riding around the courtyard. Evenings were spent around the campfire. It was nice to be able to have one after such a long time and those marshmallows tasted particularly good after the wait. Did I mention the bushflies? Oh and the snake Hannah found at night that looks suspiciously like a western brown. Can anyone confirm its identification for us? We left Perth late as there were a few last minute errands that had to be run, but the Pinnacles were still targeted for a visit. We arrived in Nambung National Park late in the afternoon and it was horribly overcast so the light was not optimal for photography, but the park is stunning. The rock pinnacles appear to be growing from the desert floor, and are the product of an unusual geological process that started with submersion of forests in sand, conversion into limestone over the millennia, and subsequent erosion of surrounding sand over more millennia has left the petrified sentinels littered across the landscape as it is today. The park has walking trail and drive, but you are free to explore on foot so long as you don’t climb the rocks. We walked and drove around twice and reluctantly left as darkness arrived. The flies were revolting, even immune to our special cedar and rosemary cream (that worked fine until now), taking delight in sticking to our faces, shirts, shorts, basically everywhere. We still had 50km drive to the campsite at Sandy Cape, just north of Jurien Bay. Camp went up and the flies descended on us. Apparently they had only arrived the day before. We put our light on and then super-sized flying “bulldog” ants descended, so we beat a hasty retreat to the trailer for the night. Next morning, more rain and flies, so the full awning was put up. We revisited the Pinnacles once more, headed into Cervantes, then Jurien Bay for fish and chips. Stockyard Gully Caves are one of the few free entry caves in the area accessed by 4WD track and the next morning we left early armed with torches and raincoats. From the carpark a pleasant 300m walk down the dry (despite the rain) river bed brought us to the first cave. A powerful torch is required as it is pitch black and approximately 100m long. It emerges at a rockpile which we climbed down and walked on to the next two caves. The last one has no exit and is home to a colony of bats so access is discouraged. All of the entrances to the caves are adorned with large beehives, and the hum of bees as you approach is very discernible, making the kids a bit uneasy. We pressed on uneventfully and had a very enjoyable morning’s exploration there. No flies in the caves either! On our way home some Geocaching took us to some marvellous beaches and lookouts in and around Green Head. The water was perfectly calm and our camp host informed us on our return that there was a storm coming with potential windspeeds of 100km/h. Whilst a lot of rain and wind followed the worst of it blew south of us and we prepared to venture further north. As well as servicing the car and trailer we spent some time exploring a few spots in Perth. Amanda’s school friend Justine and other half Steve kindly offered to put Fifty Toes up in their house so for us this was a luxurious treat. First stop was a visit to Point Walter on the Swan river where we were lucky enough to see a small pod of dolphins cruising slowly back towards the ocean. The kids swam and then fished off the jetty with tackle they had found and extracted from amongst the pylons and wooden boards. A few toadfish was all they could catch but their squeals of delight were a pleasant change from the fighting squeals we often get in the car. Black Swan, Swan river ! I took the boys to SciTech where three hours just evaporated as we immersed ourselves into a really hands-on scientific experience. The boys favourite was the slime show, but we watched the planetarium show as well, and spent most of the time playing with things like gyroscopes, plasma balls, speed radars (for the record I threw a tennis ball at 100km/h), and much much more. it was so engrossing I forgot to even take any photos. Great value and well worth a visit for all ages up to teens and beyond. We spent some time in Fremantle too. One of Xavier’s best friend’s family flew in from Sydney and we explored the markets that have everything from fresh tropical fruit and vegetables to indian headdresses! Fish and chips is a local institution so we sat on a boat in the harbour and listened to the live music as we ate our lunch. Then we had to visit Rottnest Island. An early start saw us boarding the ferry at 7.30am and queueing to hire bikes by 8.10 on the island. First stop, Little Parakeet bay for some snorkelling, then off on our bikes again. Quokkas are the endemic marsupials of the island and we found heaps of the tame little creatures everywhere. Their cute faces and endearing nature could not be missed resulting in many stops along the way. Oscar, though, was the only one with the willpower to make it all around the island on his tiny single gear bike, once again showing us his enthusiasm on two wheels. Whilst the others turned around half way the two of us got to the western end of the island where we saw the seal colony, king skinks, and even another dugite that I nearly trod on. That night, we enjoyed dinner with Justine and Steve in Fremantle and saw some of the street theatre festival that was on for Easter. Mr Spin span out his show for too long but his final stunt was good, juggling with a glass of water balanced on his forehead whilst riding a 7 foot high unicycle! Time was fast running out but we had time to visit Kings Park, commanding glorious views over the city CBD and the Swan river, amazing botanical gardens, and catch up with two new sets of friends from Cape Le Grand. Dale and Mel had invited us over for a barbeque which was a lovely opportunity to catch up while all the kids paired off again and went wild in their swimming pool. Ian and Jackie had pretty much been feeding everyone at the Cape Le Grand campsite and after having us over for dinner one night, insisted we stayed with them before leaving Perth so after farewelling Justine and Steve we visited them again just as the weather started to deteriorate again. We’re hoping they join us on the Gibb River road in a month or so! We had to head to Perth to get the Pajero and Camprite trailer serviced before we commence the journey north and possibly the most eagerly awaited part of our trip. Both have performed excellently to date but I had a list of items to follow up with for both. I wanted to ask further questions about the problems with had with fuel consumption in South Australia and had been tipped off about possible carbonisation of an inlet manifold. We had also recently become aware of a recall notice on the model. I finally wanted to resolve the issue with our towbar being too low, and Mitsubishi Melville instantly gave me confidence with their understanding of each issue and ability to address them. We also needed to perform a tyre rotation having just clocked another 10,000km. The Camprite trailer went in first and it was great to meet the team in person, as we had only had spoken by phone from the east coast. Matt patiently listened to my list, had a quick look at the trailer and spotted a couple of things we had missed, again assuring that they were all fixable. We left it in his capable hands and I took the boys to SciTech in the city. The next day was the Pajero’s turn. They kindly agreed to complete the service by 2pm (so I had time to pickup the trailer on the other side of the city) and went through my list of items. They couldn’t put in a second battery, but I was less concerned about that. Phillip from Mitsubishi drove me back to the house, where we were staying and also picked me up promptly at 2pm. Everything was fixed up and the spare tyre lift meant we were set to fix our towbar issues. Being the afternoon before Easter holidays, traffic crossing town was heavy and Matt at Camprite was patiently awaiting our arrival to pick up the trailer. It looked like new! Our damaged rear steps had been replaced with the new design and all the other items on the list had been addressed, leaving us a little time to fix the towbar. Matt optimistically thought it would be a quick reversal of the towbar, but that proved more difficult requiring some heavy duty hardware and hammering for quite a while to remove. Reversing it didn’t solve the issue as the tongue was not long enough so Matt quickly drove up to get one. He returned empty-handed and we jumped into the car at 4.40pm to try a different place. Success! The tongue then needed machining the edges of the tongue to allow it to be inserted easily – more time passed. Finally by 5pm the job was complete, Matt was still smiling, but we were so grateful that he had stayed back to help prepare us for the next stage of our journey. Thank you very much Camprite – your attention to detail was probably the best we have ever encountered and thanks also to Melville Mitsubishi for your prompt, friendly and efficient service. Our friends from Margaret River, Mike and Rhonda, invited us to visit them in Margaret River and given how close it was, and how much we had enjoyed the region we did a little back track. Mike is a surfing legend, with many titles to his name, including a number of appearances representing Australia. They now both dedicate their time to surf coaching and helping with the organisation of events such as the upcoming Drug Aware Surf Margaret River Pro 2015 at nearby Prevelly Beach. The morning we visited the beach the surf was pumping, the most impressive I have ever seen, with plenty of breaks everywhere for everyone from Beginners to Legends (a plaque above the beach tells you where to surf, assuming you know where you stand in the scale, Beginner, Rookie, Master, and Legend). Main Break and The Box were producing some nice waves and a constant stream of locals were arriving to make the most of it. There were boards that has lost their owners and broken boards floating past, some great barrel action and then a flare went up in the sky behind the Box. A rescue operation followed and we watched a jet ski retrieve a local fisherman from his sinking dinghy. It all happens at Prevelly Beach! A few hundred metres away we found a cool coffee van at the Rivermouth break. At this time of year the river fails to meet the ocean, stopping just behind the beach. A little further north Gracetown offered a smaller but clean wave for a number of surfers. Travelling back down to Margaret River we had a quick diversion up to Cape Naturaliste National Park to see some of the beaches we hadn’t seen yet. Eagle Bay offered us a few Geocache opportunities and a collection of small picturesque beaches with glorious white sand and azure water lapping on to the shore. Meelup Beach was hosting an end of Nippers season event with massive inflatable floating toys. The kids made us stop, and following the fastest change witnessed to date, were in amongst the fun before we gather our towels. Many thanks to Smiths Beach Surf Lifesaving Club for allowing us to join in the fun. We also had to visit Cowaramup, where locals have installed at least 25 (our count on one drive past) fibreglass cows throughout the town. Not pronounced as it looks, it means “Place of the purple crowned lorikeets”. Many of the places in this region end in “up”- an aboriginal word meaning “place of”. With so much to do in this area time flew and it was time to finally say farewell to our friends and Margaret River. Time to hit the big smoke again up north. Unreported shark attacks along the south coast! On our travels along the southern coastal bits of the country we have noticed an alarming number of shark attacks that go unreported. The evidence of these attacks can easily be found as the poor victims body parts are strewn across many of the beaches we have visited. I have even personally witnessed one such attack in the water in Sydney and can report that luckily the victims are already deceased. The sharks are actually just doing their duty of cleaning up the dead carcasses of cuttlefish. Cuttlefish have a relatively short lifecycle usually only living 2-3 years. They breed and die shortly afterwards, providing a vital food source to any hungry scavengers. All that is left after the clean-up process is the brittle internal cuttlefish bone that can be found washed up on the beach. 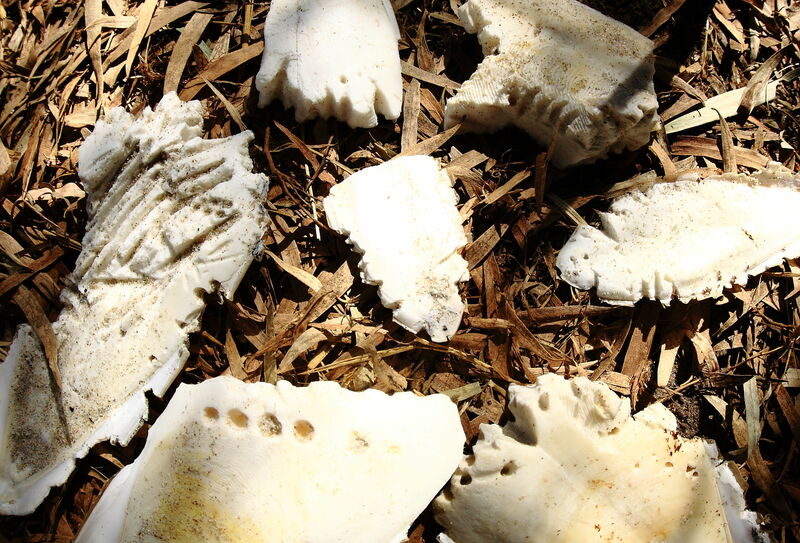 We have frequently found these cuttlefish bones bitten in half, or covered with shark teeth indentation marks (see photo). Basically it is the case of nature taking its course and nothing sinister as the heading might have implied.